As the Krypton-shattering news broke yesterday that Henry Cavill would apparently be stepping down from his role as Superman, fans were quick to wonder who could fill the character’s iconic red Y-fronts. Speculation was rife, with names like Michael B, Jordan being thrown around to take up the mantel. However, one name which has always been infamously associated with Superman is the amazing, versatile (but somehow still always himself in everything he does) Nicolas Cage. David Lynch famously once called Cage ‘the jazz musician of American acting,’ while in a recent Reddit AMA, Ethan Hawke said Cage was ‘the only actor since Marlon Brando that’s actually done anything new with the art’. And while every role Cage takes on somehow becomes iconic, he has – so far – never undertaken a character as iconic as the last son of Krypton, Superman. Cage has been tantalisingly close to playing the caped crusader in the past, and fans think now is the perfect time for him to don the outfit once and for all. 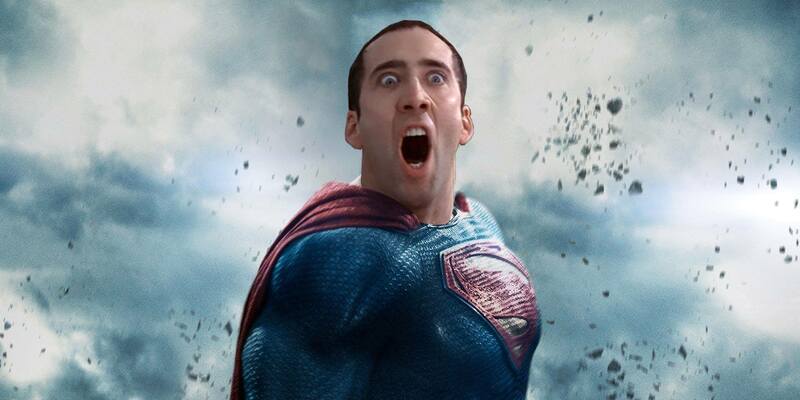 I think the world is finally ready for a Nicolas Cage #Superman. It’s also worth noting, as such a massive Superman fan, Cage even called his own son Kal-El, after the superhero’s birth name. So it could go hand in hand? In almost mythical Hollywood folklore, Cage was once signed up to play Superman in a film directed by Tim Burton. It was to be called Superman Reborn, and was poised to take on the Death of Superman storyline from the original comics. As Comicbook reports, the film started under the supervision of producer Jon Peters and writer, Jonathan Lemkin. The script changed hands, however, with Kevin Smith rewriting it. A further rewrite was made be Wesley Strick, with the title changing to Superman Lives. As the photos show, the film got as far as pre-production, with Cage posing for test fittings in the famous suit, only for the studio – Warner Bros. – to pull the plug on the project a few weeks before shooting. The only thing I’ll say about that — because that is such a lighting rod hot topic and if I say anything at all it just seems to snowball — but I will say that I had great belief in that movie and in what Tim Burton’s vision was going to be for that movie. I would’ve loved to have seen it, but I feel that in many ways, it was sort of a win/win because of the power of the imagination. I think people can actually see the movie in their minds now and imagine it and in many ways that might resonate more deeply than the finished project. While the power of the imagination is great, fingers crossed we might still see Cage in the legendary role one day soon.